Savings bonds are among the safest of all investment securities. 1. When an I or E Savings Bond Matures Is It Worth More Than the Face Amount? 2. Does the Rate on a Savings Bond Fluctuate With the Market? 3. How Long Till a Savings Bond Matures at Face Value? Series E bonds were the fifth series of the U.S. governments savings bond program, replacing the "baby bonds" on May 1, 1941. Originally called Defense Bonds, Series E bonds were rechristened War Bonds as the United States became embroiled in World War II. Series EE bonds replaced Series E bonds in January 1980. Minimum interest rates on by Series E and Series EE bonds vary based on the bond's issue date. 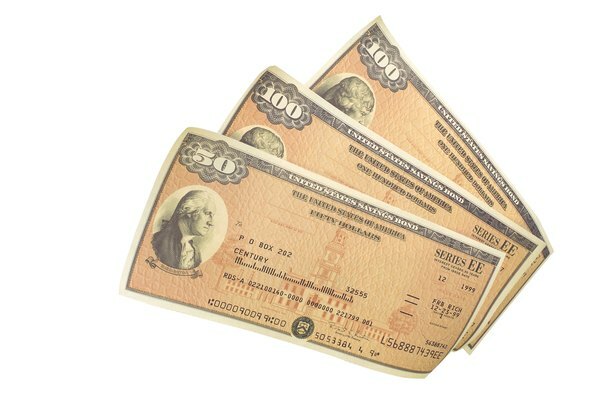 Series E bonds were issued at a 75 percent discount to their face value, and they matured at face value after 10 years. Congress granted interest extensions to Series E bonds issued through November 1965, allowing them to earn interest for up to 40 years. Series E bonds issued after that date were granted interest extensions of 30 years. All Series E bonds have ceased earning interest, so the minimum guaranteed interest on outstanding Series E bonds is 0 percent. Series EE bonds issued before May 1995 earned interest at the higher of market rate or the guaranteed minimum rate. As of late 2012, Series EE bonds issued through December 1982 had ceased earning interest, so the minimum guaranteed on any of those outstanding bonds is 0 percent after that point. The guaranteed minimum interest rate for Series EE bonds issued from November 1982 through October 1986 was 7.5 percent. Bonds issued from November 1986 through February 1993 had a guaranteed minimum rate of 6 percent. The guaranteed minimum rate for bonds issued from March 1993 through April 1995 was 4 percent. There was no minimum guaranteed interest rate on Series EE Bonds issued from May 1995 through April 1997. Rates on these bonds were adjusted each six months and fluctuated based on how long you owned them. During the first five years the bonds earned 85 percent of the three-month average of six-month U.S. Treasury Securities. Bonds held longer than five years earned 85 percent of the six-month average of five-year U.S. Treasury security yields. All bonds purchased from May 1997 through April 2005 earned 90 percent of five-year U.S. Treasury security yields regardless of how long they were held. Series EE bonds issued after April 2005 pay an interest rate that is fixed for the life of the bond as of the date of issue. The interest rate is determined twice per year, in April and November, and all bonds issued between those dates carry the same interest rate. These bonds do not carry a guaranteed minimum rate beyond the stated interest rate, but the U.S. Treasury does guarantee that the value of these bonds will at least double after 20 years. If the stated interest rate is not sufficient to double the bond's value, the Treasury will make a one-time interest adjustment upon maturity to make up the difference. Does Every Savings Bond Have a Different Interest Rate? Why Do Some of My I-Savings Bonds Show a 0% Interest Rate? How Long Do You Have to Keep a Series EE Bond?